Back in 2010, Google introduced WebP image format which is up to 45% smaller than PNGs for similar quality. Google WebP image format is obviously supported by Google Chrome and the Chromium-powered browsers such as Opera. Windows 10 October 2018 Update introduced support for WebP image format in Microsoft Edge and it appears that Mozilla is also embracing Google’s technology. According to CNET, Mozilla’s Firefox browser is finally getting support for Google’s WebP image format. “Mozilla is moving forward with implementing support for WebP,” the nonprofit organization told CNET. Mozilla plans to enable WebP image format support in Firefox for desktop and Android but it’s not coming to iOS. 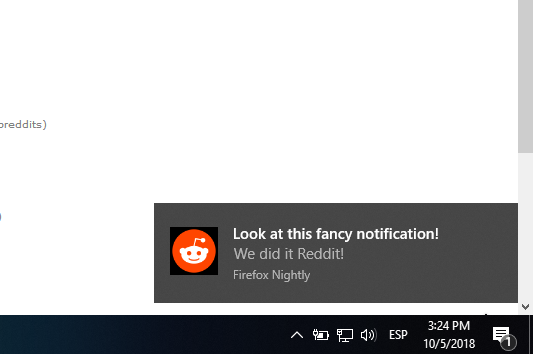 In other news, Mozilla recently confirmed that Firefox 64 will support Action Center notifications in Windows 10 and the feature has already made its way into the nightly builds. This feature has been heavily requested but it’s not something that everyone is going to like. In the nightly builds, there is no way to disable Action Center support. According to a commit on Bugzilla, Mozilla is expected to add support for Windows 10 native notification in Firefox 64.